Total assets held by the nation’s banks have grown dramatically in recent years, from $8.4 trillion at the end of 2002 to $13.3 trillion as of the end of June 2009. 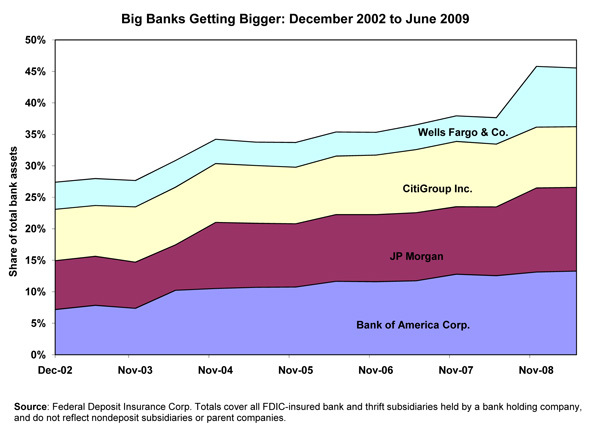 Within that rapidly expanding universe, a handful of mega-banks have grown even faster, taking an ever-larger share of the total. As of this summer, the four largest bank holding companies—Bank of America Corp., JPMorgan Chase & Co, Citigroup Inc., and Wells Fargo & Co.—accounted for nearly half of all bank assets held in the United States. That’s significantly higher than in late 2002, when their share was a mere 27%. With some 8,000 small to mid-sized banks, the U.S. financial sector remains far more diverse than those of most European countries, where a few large banks have long dominated the financial sector. But at the upper levels of finance, the trend toward consolidation is clear. It was made possible by a series of regulatory changes in the 1990s that eliminated geographic restrictions and the separation of commercial and industrial banking, in the hope of achieving greater efficiencies and competitive advantages in a global environment. Today, that philosophy is being reevaluated and policy makers are looking at a variety of approaches to keep the big banks at a more manageable size.